Omouri trains on his new power wheelchair, alongside occupational therapist Jaclyn Gaudio (L) and physical therapist Jessica Lake (R), in The Steven and Alexandra Cohen Pediatric Long Term Care Pavilion as part of Blythedale's Assistive Technology Program. An infectious smile and big, brown eyes. These are just a few things you notice about Omouri when you first meet him. The two-and-a-half-year-old is unable to talk, but can speak volumes with just a look or a grin. “He’s full of energy and wants to express himself, but is unable to do so secondary to his medical condition,” said Dr. Milicent Mitchell, Medical Director of the Steven and Alexandra Cohen Pediatric Long Term Care Pavilion and Chief of Pediatric Pulmonology for Blythedale Children’s Hospital. Born seemingly healthy and full-term in December 2015, Omouri was diagnosed with spinal muscular atrophy (SMA) at four-months-old. This progressive, genetic disease weakens his body as he grows, causing difficulty in performing basic life functions like breathing, eating and walking. But, despite his physical limitations, his mind is fully functioning and he is cognitively aware of his surroundings. 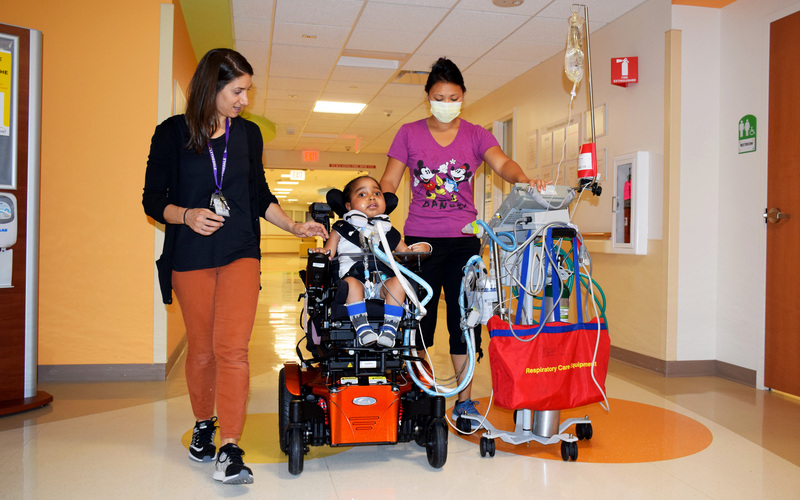 Omouri’s decreasing muscle strength prompted his medical team at NewYork-Presbyterian Morgan Stanley Children’s Hospital to insert a feeding tube due to his strained swallowing and aspiration of liquids. Additional complications developed and the toddler underwent surgical placement of a tracheostomy which also prompted 24/7 ventilator dependency. Days before Christmas in 2016, Omouri was admitted to the inpatient unit at Blythedale Children’s Hospital. “They told me that Blythedale is one of the best hospitals and a great place for me to learn about his medical care while he recovers,” Nordia said. Omouri immediately benefitted from the Hospital’s holistic, interdisciplinary approach, coupled with his new team of doctors, nurses, therapists and other clinical professionals. He was then transferred to the Steven and Alexandra Cohen Long Term Care Pavilion at Blythedale for ventilator management, parent education training and intensive physical, occupational and speech therapies. In January 2017, Omouri was introduced to Blythedale’s burgeoning Assistive Technology (AT) program, one of only a few such programs in New York. State-of-the-art technology was integrated into Omouri’s daily living activities, expanding opportunities for him to explore his environment, build social interactions and participate in school settings. Blythedale’s AT Team was able to capitalize on Omouri’s cognitive skills while also transform his small, limited movements into big results. During his immersive training, Omouri learned how to flex his wrist on a joystick to help drive a power wheelchair and explore his environment. He also worked on tapping his finger to engage a switch. This allowed him to play with toys, games and even apply his growing academic skills to choosing colors or drawing. “With AT, we can stand back and let him take the lead,” said Jaclyn Gaudio, Occupational Therapist at Blythedale. Communication is one of those gaps now being crossed. Using Omouri’s active ocular movements, he now utilizes an eye-gaze system to convey his wants and needs to his family, friends and medical team. After witnessing Omouri’s evolution at the hands of assistive technology, Dr. Mitchell expressed her enthusiasm for other long-term-care patients benefitting from the program. As Omouri’s mother anxiously awaits that day, she continues her parent education training at Blythedale and happily watches her son’s daily progress.